Waste Management, Inc. (Houston, TX) unveiled its new $15 million, 40,000-square-foot single-stream recycling facility in its home town of Houston. The sophisticated new facility will employ sorting machines, which use magnets, screens and scanners to separate and sort recyclables. It will also include two new and unique pieces of technology: a "paper magnet" for removing small paper and recyclable residue and a "paper spike" that mechanically removes boxboard/chipboard from newspaper. It will also include magnets and eddy currents to capture the remaining metals. Two large balers bind the finished products into bales weighing as much as 1.5 tons. It currently has a capacity to handle more than 9,000 tons of recyclables each month. Single-stream recycling is credited with boosting recycling rates by streamlining collection and encouraging more customer participation by simplifying the process. "The less work the customer has to do to get these materials to the curb themore it helps participation," said Alan Bachrach, director of recycling for Waste Management in south Texas. HOUSTON, Aug. 8, 2011 /PRNewswire/ -- Waste Management (NYSE: WM) today joined with the City of Houston, local and state officials and WM customers to celebrate the launch of its Houston Material Recovery Facility (MRF), located in Southwest Houston. This 40,000-square-foot facility is one of the most technologically advanced single-stream sorting systems in the country, exemplifying Waste Management's commitment to recovering value from waste materials. Single-stream recycling streamlines and simplifies the process of collecting and processing recyclable materials, increasing recycling rates by up to 50 percent. In a single-stream system, residents and commercial customers place recyclables in a single container for pickup, and no longer need to separate these materials in their homes or workplaces. When recyclables arrive at WM's Houston recycling facility, advanced technology including magnets, screens and optical scanners are used to separate, sort and process newspaper, mixed paper, plastic containers, polyethylene terephthalate (PET), tetrapack and glass, which are then shipped out for reuse. Waste Management Recycle America's Houston facility will also include two new and unique pieces of technology: a "paper magnet" for removing small paper and recyclable residue from the container stream and a "paper spike" that mechanically removes boxboard/chipboard from newspaper. It will also include magnets and eddy currents to capture the remaining metals. Two large balers bind the finished products into bales weighing as much as 1.5 tons. "Waste is no longer something to get rid of – it's a resource. That's why Waste Management is leading the way in implementing innovative solutions such as single-stream recycling to benefit the communities and customers we serve," said Waste Management CEO David Steiner. "We are proud to make the investment in this facility to help move Houston and the surrounding region to the forefront of recycling." 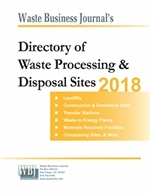 "Waste Management has been a leader in the region in developing sustainable techniques to address the evolving demands and needs of the customers it serves. This is evidenced by the investment made at their new single-stream recycling facility," said City of Houston Council Member, Anne Clutterbuck. "It's my hope that the single-stream capacity offered at this new facility will be a catalyst for the City of Houston to completely convert its recycling program to single-stream." Waste Management invested more than $15 million to create one of the most advanced single-stream technology plants in operation. The Houston MRF can sort and process more than 9,000 tons of recyclable newspaper, cardboard, aluminum, glass and plastic each month. In addition, the plant accepts a range of materials that have historically been discarded, such as film plastic and rigid plastics, expanding the range of materials that can be recycled. "Our commercial customers have already seen the benefits of our integrated recycling, and we believe our residential customers will too," said Alan Bachrach, director of recycling, WM South Texas. "The less work the customer has to do to get these materials to the curb the more it helps increase participation. Everyone is busy, but wants to do their part in making our planet greener. We are excited to help make this a reality by investing in this type of technology." In addition, the Houston MRF accepts materials from the City of Houston's single-stream residential collection program and other communities and commercial customers in the region. Once fully staffed, the facility will employ over 60 people, most of them hired from the Houston area. This project is part of Waste Management's sustainability initiative to nearly triple the amount of recyclable materials it recovers, from approximately 8 million tons today to over 20 million tons by 2020. The key to increased participation in recycling starts with education. The new facility added a 20-foot-by-40-foot education center to host tours and classes to teach the fundamentals of recycling. The interior of the education center was designed and built by Dan Phillips and The Phoenix Commotion Crew, a Houston-based building initiative known for using recycled and salvaged materials. "The whimsical, colorful room is a great example of practicing what we teach," said Lisa Doughty, public affairs manager, WM South Texas. "From the reused CDs on the ceiling to the mosaic murals on the walls, you can't help but look at the things you throw away in a different light." "Waste Management is focused on recovering more of the valuable materials in waste streams through the use of superior technologies such as single-stream recycling," said Patrick DeRueda, president, Waste Management Recycle America. "By making the process of handling recyclables simpler for local residents and businesses, this facility has the potential to significantly increase local recycling participation rates, enabling us to further reduce waste, recover more material and improve the effectiveness of municipal and commercial recycling programs." Waste Management, based in Houston, Texas, is the leading provider of comprehensive waste management services in North America. Our subsidiaries provide collection, transfer, recycling and resource recovery, and disposal services. We are also the largest residential recycler and a leading developer, operator and owner of waste-to-energy facilities in the United States. Our customers include residential, commercial, industrial and municipal customers throughout North America. 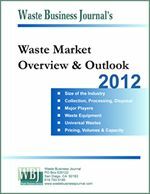 To learn more about Waste Management, visit www.wm.com or www.thinkgreen.com. WM Recycle America LLC is a subsidiary of Waste Management and is the largest residential recycler in North America. WM Recycle America's business lines include processing many types of consumer-generated recyclables and finding the best markets for the recyclable commodities produced. In its capacity of providing processing and marketing services, WM Recycle America offers a wide variety of recycling options for municipal, manufacturing, commercial and residential customers.